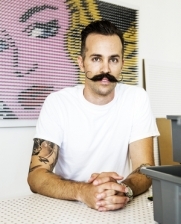 Mixed-media and sculptural artist Matt Bilfield lives and works in Los Angeles. Somewhat of a neat freak and minimalist who thrives on order and pragmatism, he is drawn to detail oriented, creative outlets to express his inner vision. These factors influenced his career selections to focus on graphic design and explore three-dimensional art. Matt Bilfield’s mixed media artworks are a fusion of pop art and contemporary three-dimensional design, constructed from wooden dowels anchored into architectural plywood. He takes aspects of digital technology and expresses the pixilation and color graduation in more traditional media. 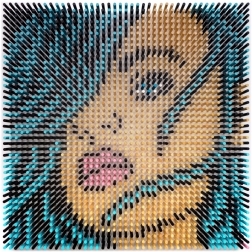 A pixelated representation of a single image emerges from his careful placement of each individually colored peg.